Simultaniety Unravelled! New RH Solo LP! Tonight, May 28, 2011, as part of the SOUNDS LIKE...AUDIO ART FESTIVAL, Mannlicher Carcano will be performing a special 1 hour version of the Radio Hour from the AKA Gallery in Saskatoon, Saskatchewan. 2011 will mark the beginning of an annual juried audio art festival hosted by AKA. Sounds Like… aims to bring together artists from across the country and beyond to share their work and processes. The festival's title references both simile and charades, speaking to the performative and interdisciplinary aspects of the work to be examined here. Along those lines, the inaugural year of the festival will examine various ways in which the movement and actions of a performer relate to the auditory content. 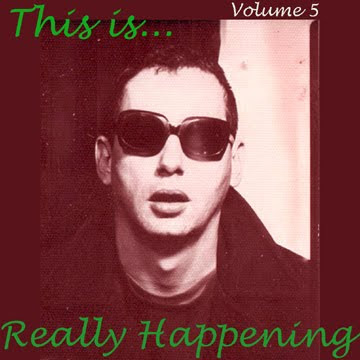 The Los Angeles portion will be broadcast from the opening of Tel/Art/Phone a group show at the Beacon Arts Building based on the communication breakdown party game Telephone, to which Mannlicher contributed a regrooved LP in a sleeve by hack artist Doug Harvey. 808 N. La Brea Ave. 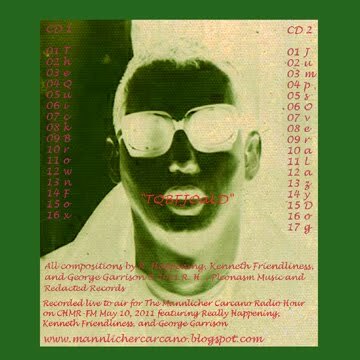 This event also serves as the release party for the new Really Happening solo double CD set (5th in a projected series of 10, in this case featuring Kenneth Friendliness and George Garrison) "This is Really Happening Vol 5: TQBFJOaLD" which is available for free download here.